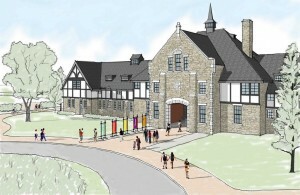 A rendering of the Duke Farms barn. The Duke Farms Foundation is transforming into a regional center for environmental stewardship, offering educational programs with a focus on sustainability and the responsible management of land resources. Duke Farms in Hillsborough Township was originally developed as the private estate of tobacco and hydropower magnate James Buchanan Duke. By the time he died in 1925, he had transformed more than 2,000 acres of farmland and woodlots into an extraordinary landscape, excavating nine lakes, constructing 45 buildings and nearly 2.5 miles of stone walls and more than 18 miles of roadway. His daughter, Doris, inherited control of the estate, and continued to add to the property, purchasing several small, 19th-century farms along its western boundary. When she died in 1993, she expressed in her will that Duke Farms serve as a haven for native flora and fauna and be used to drive positive change on issues concerning the health and protection of the environment. Duke Farms underwent an exhaustive planning process, taking stock of its resources, working with state, federal and local conservation organizations, reaching out to local communities to assist in the development of a new vision for the property. With its refocused mission, Duke Farms will provide many ways for visitors to understand the interrelationship between land management and the quality of the living landscape. A constructed wetland system will treat wastewater generated on site using native plants. Visitors will see first-hand in the parking lot how stormwater can be filtered and returned to groundwater through the use of bioswales and rain gardens. Since 2008, Duke Farms has been providing formal and informal education programs, with classes in subjects ranging from orchids to bird identification to organic farming to summer biking tours. Agricultural and horticultural programs and workshops for farmers and landowners are available on a variety of topics, including how to integrate wildlife enhancement and management strategies with farm production practices and assessing and improving soil health. In addition, NOFA-NJ will offer programs on organic gardening practices for home gardeners, and NJ Audubon will conduct nature programs throughout the property. Both of these organizations, as well as other partners, will maintain offices in a campus surrounding the Visitor’s Orientation Center. Local residents will also have a chance to sign up for plots in the soon-to-open community garden. A site plan at Duke Farms showing the farm barn as an orientation center. Duke Farms is adaptively reusing a number of buildings to serve the new vision. The Farm Barn, once used to shelter thoroughbred horses and later dairy cattle, will provide 22,000 square feet for a combination of uses, including an orientation center, classroom and meeting space. A 640-killowatt ground-mounted solar array of 3,120 panels provides 100 percent of the estimated electrical power for the renovated Farm Barn. This alternative energy component complements 54 geothermal wells that aid in efficient heating and cooling of the orientation center and surrounding offices. Other buildings being adaptively reused are two historic conservatories, originally used to supply produce and flowers and later filled with orchids and plant collections featured as part of the Duke Farms public garden tour. One of the conservatories and greenhouse complexes has been renovated and is the center of native plant nursery where more than 100,000 plants have been propagated and used in restoration projects on the property. The second conservatory is being renovated to LEED Gold standard, the first LEED-certified conservatory in the nation. Duke Farms underwent an exhaustive planning process, taking stock of its resources, working with state, federal and local conservation organizations, reaching out to local communities and other public gardens to assist in the development of a new vision for the property. Duke Farms has worked diligently to lead by doing, and will serve as a model of stewardship and sustainability for the 21st century. 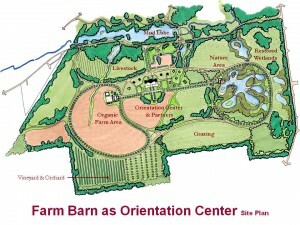 Update, 11/21/2011: The Somerset Messenger-Gazette profiles the work being done at the farm.